The Cab Grid calculator interface starts with the destination field disabled, so the pick up location (origin) must be selected first. Once the origin is selected, the destination list is enabled and any available destination can be chosen. If there is no price configured for the journey from origin to destination, the customer will see the message configured under the “NO PRICE MESSAGE” option found in the OPTIONS tab of the Cab Grid Pro WordPress Admin interface. This behaviour is fast, but it can lead to customer frustration… especially if presented with a high number of destinations that do not have a price configured. To solve this, Cab Grid Pro can be configured to only show destinations based on the select origin. Destinations that do not have a price configured for the corresponding origin will be omitted from the list, meaning only valid journeys can be selected. This option is configured under the “HIDE UNSUPPORTED DESTINATIONS” found in the OPTIONS tab of the Cab Grid Pro WordPress Admin interface. With this option enabled (set to “Yes“), a call back to the web server is required. 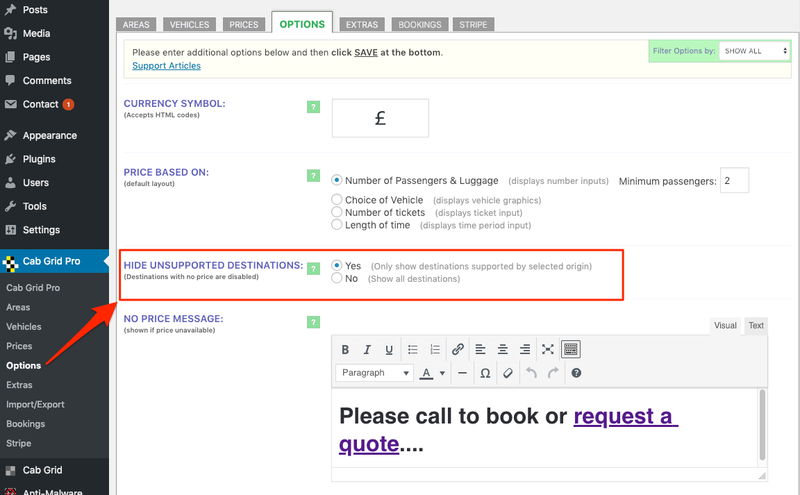 This means that the destination drop down menu will remain disabled a while longer whilst the destination list is retrieved. This will occur each time a new origin is selected. Another potential drawback is, with this option enabled, the “No Price Message” is not displayed, meaning the customer can not be prompted to request a quote or take another action (within the Cab Grid interface). With the “HIDE UNSUPPORTED DESTINATIONS” option disabled (set to “No“) all destinations are listed. 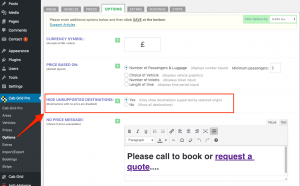 If no price is available for a selected destination when selected, the “No Price Message” is displayed as configured. This option was added in Cab Grid Pro v5.2. In certain instances the NO PRICE MESSAGE will still be displayed. For example, if the origin and destination are swapped and the subsequent journey is not valid. Destinations are not made available based on vehicle. That is, if there is a valid journey price configured for one vehicle, but a different vehicle has no price configured for that journey, the destination will still be made available. Customer input that might define the vehicle (passengers/luggage/etc.) is ignored when populating the destination list. Specifying a predefined destination via shortcode attribute or widget options may cause unexpected results when Hide Unsupported Destinations is enabled.